Bitcoin is hard to ignore, so I thought I would explain what it is, what it isn’t and what does it all mean for the rest of us. There is really no such thing as an actual Bitcoin. You can’t touch them. They don’t exist on a piece of paper and there are no actual minted coins. Instead Bitcoin exists as a transaction logged in a distributed transaction journal which exists as a secure database on computers around the world. Bitcoin is a cryptocurrency which is based on Blockchain technology. Blockchain is a method for computers to keep track of transactions in a secure way that supposedly cannot be hacked. When a transaction occurs, its logged in many many computers around the world. Blockchain is secure because changing an entry in a blockchain will alter and corrupt all entries after it in the chain. So all transactions are permanently and securely stored. Bitcoin is based on blockchain and that is why people think Bitcoin is secure, but blockchain is very useful in ways other than with cryptocurrencies. Major banks and financial institutions around the world have invested in blockchain technology. But I digress, since we are really talking about Bitcoin here. Just suffice it to say that Bitcoin could not exist without blockchain, but blockchain has an existence separate to Bitcoin. Bitcoin was started by a shadowy figure using the alias Satoshi Nakamoto. He (or they) created this digital currency independent of any government oversight or regulation. It exists on computer networks and has a limited supply. You create Bitcoin by “mining” it. When the digital currency was first created, mining it was very easy, but the algorithm gets automatically more and more complex as more and more of the currency is created. Eventually, there will not be enough computer power in the world to create an additional Bitcoin. This system ensures that there will be a limited supply and no one can easily “print” more of the digital currency. Currencies can be created or in this case mined. Currencies can be used for transactions. Vendors will accept them. Currencies can be exchanged for other currencies. It turns out Bitcoin does have most of these attributes at least to some extent. We already talked about how Bitcoin gets created. It holds value as long as people are willing to exchange it for other currencies and at the moment that is possible. There are a few vendors who will legitimately accept Bitcoin for transactions, but because the value is fluctuating so much, there are not many. Bitcoin was originally used by vendors on the dark web to sell drugs, stolen goods, and services which the vendor and customer wanted to keep anonymous. This has changed and now vendors including Expedia, Microsoft, and Newegg. The easiest way to buy Bitcoin is using a Bitcoin exchange. These companies will take your dollars (or other currencies) and enter transactions in the blockchain on your behalf and give you a wallet which indicates your Bitcoin holdings. Many of the exchanges exist outside the US, but there are some within the US. The largest and best known is called Coinbase. 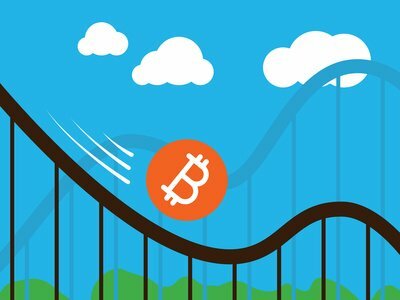 Bitcoin has been remarkably volatile. Most traded currencies in the world belong to governments and these governments have a vested interest in keeping the currency stable. No one would use the dollar for business purposes if one day your dollar is worth 0.85 Euros and the next day it is worth 0.15 Euros. Then the day after it goes back to 0.80 Euros. If you are trying to buy tasty Belgian chocolate to sell in the US, clearly it would be impossible to use your dollars to do the purchasing. The Belgian chocolate maker would never know how many Euros they were getting for their product. They would just refuse to accept dollars. So the instability makes it difficult to use Bitcoin for transactions. Remember that I wrote above how the supply of Bitcoin was limited by the algorithm used to create it. So this means there’s a limited supply, right? It turns out this is wrong. Because Bitcoin is not the only cryptocurrency. There are lots of cryptocurrencies, so if Bitcoin is too expensive, you can buy Etherium, Ripple, NEO, etc. In fact it turns out there are 1500 of them listed on the coinmarketcap.com website. What this means is that you can just substitute one cryptocurrency for another and in fact there is an unlimited supply. This means there is unlimited printing (mining) of cryptocurrency and you know what you get with unlimited printing of money: inflation. It’s fashionable to hate government and regulators, but the truth is regulation is very important for keeping everyone safe. It is also important in collecting taxes. You may think there is no regulation, but that is not true at all. The IRS requires you to pay capital gains taxes whenever you have had a gain after you sell something. This includes Bitcoin. It takes the IRS a while to catch up to new things, but they are starting to catch up now. Even if there is no reporting directly from the Bitcoin Exchange where you bought or sold your Bitcoin, you still owe taxes on the gains. You must report this information and if you don’t it is tax evasion. The IRS is asking Bitcoin Exchanges with a US presence to start reporting transactions and they will do so. Coinbase, the largest US-based exchange has already agreed to start reporting. If you use an offshore exchange, chances are you will be required to report your Bitcoin under FinCEN, the Financial Crimes Enforcement Agency and FATCA, the Foreign Account Compliance Tax Act. Penalties for not reporting are steep. Eventually the regulators will catch up worldwide and a number of people are going to be surprised with large tax and regulatory bills. I have no doubt that Bitcoin transactions recorded with Blockchain are secure. The problem is that in order to buy and sell Bitcoin, you have to have a wallet and typically you have that wallet with a Bitcoin exchange. A number of exchanges have been hacked, wallets have been stolen, and Bitcoin lost. If you do lose Bitcoin to fraud and hacking, there is no recourse. Your personal information is not being stored somewhere and some authority is going to check and say that you really own the Bitcoin. Its all done with impersonal identification using public and private crypto-keys and once the keys are stolen, that’s it. One news report said that the Winklevoss twins, who bought a very large amount of Bitcoin actually printed their private keys, cut up the piece of paper and saved the pieces in multiple safe deposit boxes. Of course, if one piece of the key gets lost, they may lose their Bitcoin wallet and they could still lose the value of their Bitcoin if it suddenly plummets. When you invest, you typically invest in productive assets. A productive asset is an asset which is used to create something which can increase wealth. When you buy stock, you are buying ownership in a company which produces something or transforms something to add value. When you buy a bond, you are loaning someone money to put that money to productive use. I would claim that Bitcoin is not a productive asset. It cannot be used for anything in order to create more value. I’m sure you can tell from the tone of this article how I feel about Bitcoin. It is highly volatile and thus may or may not store value. It is unregulated, yet has major tax implications. 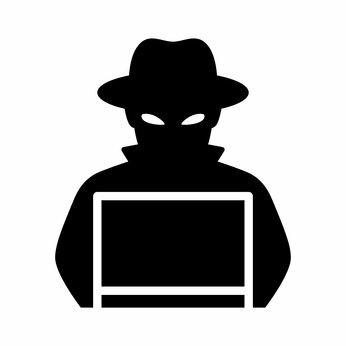 There has been a history of hacking and fraud. It is not really a productive asset. Buying Bitcoin or any cryptocurrency is not investing. I could say its speculation, but I think its even worse than that. Buying Bitcoin is like gambling when you are not sure who is running the table. 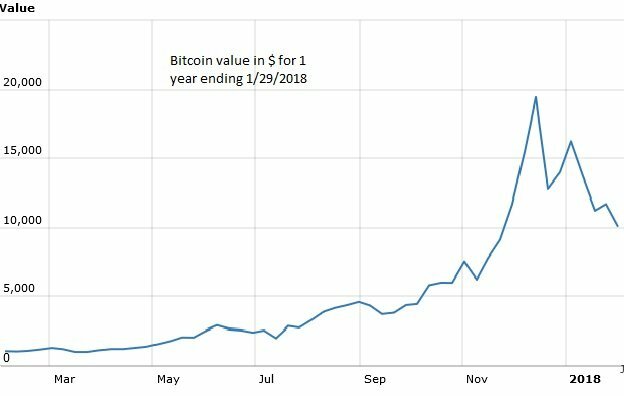 My prediction is that there will be a big drop in Bitcoin and the value will plummet down to pennies. It will probably be caused by a regulatory crackdown in China, South Korea, or India and not the US. Still, it may be the US authorities that force these governments to crack down. You should be investing your money in a diversified portfolio of listed securities that match your goals and risk tolerance. If you insist on speculation, then speculate with a small portion of your wealth and buy stock in some small company that you are sure will have the next hit product. Just make sure you understand the value behind what you’re buying. This entry was posted in BLOG and tagged Bitcoin. Bookmark the permalink.